Dark ambient always interests me. Sometimes it provides a counterpoint to metal, when I need to listen to something quieter but still want something that has a strong personality to it. 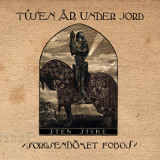 So when I saw that Swedish ambient outfit Tusen År Under Jord's 2013 cassette, which sold out almost immediately when it was first released, was getting re-released as a CD, I gave it a whirl to see what I might have missed. Due to the eclectic nature of the genre, it's easy to get a surprise, and Sorgsendömet Fobos is such an album. It has a ghostly, mysterious sound that builds a subtle edge of tension and keeps the listener ever so slightly off balance. The original cassette sides are here broken into five parts with a sixth bonus added to it. I've heard the music referred to as drone, and I can definitely see where that moniker comes from given that there's an even background of noise at times, including a hum like a transformer about to go out, but it's a lot more varied than drone normally is. Behind the electronic buzz on the first track is a haunting background of piano and violin, repeating without sounding sampled, slowly evolving from one mood to another -- though the moods are always dark. As if the music is on an old record, static crackles faintly through all the tracks, and at times there's a hitch in the rhythm of an otherwise straightforward melody, or the track drops sickeningly to a lower timbre, as if the record skipped or the record player malfunctioned for a moment. There is an ominous feel to the whole album, like the quiet parts of a slasher movie when the lead character is looking through the items in the killer's bedroom, not knowing he is waiting outside in the hall. What Daniel, the guy behind this project, does here with atmosphere is incredible. From rolling strings with sharp jazzy horns sawing through, to sighing violin quartets that fall apart into uneasy dissonance, to hazy, stuttering woodwinds marching over dull cello, the whole composition transports the listener to a gloomy, dim, but somehow beautiful world. There's no vocals, no drums, no attempts at a consistent melody or even a rhythm, and the longest track melts from background hums of barely-heard music to louder, more insistent violins and back again. I wasn't sure what I was going to make of Sorgsendömet Fobos, but it's a real treat to hear and will likely continue to make an appearance on my playlist. Listeners to drone or neoclassical darkwave, or metalheads in the right mood, will hopefully enjoy this as much as I did.